Yesterday evening, my four oldest girls and I went down the street to our friend’s house to hang out for a bit and watch some guys skate on the half-pipe in the yard. Armed with my old-school Minolta MC Rokkor-PG 58mm f/1.2 and a Rokinon 14mm f/2.8, I had a second go of shooting skateboarders in action. None of my lenses are autofocus which adds an extra layer of challenge to making any sort of presentable shots. For all of these shots, I used predictive focus. To set up the shot, I would position myself in a way to get an interesting composition and some “windows” in the background to help frame where I suspected my subject would eventually pass through. Finally, I would pre-focus the lens to the spot where I believed they would be in my frame. Repetition and confinement to the pipe helped out a lot with all the guesswork. For this shot, I used the 58mm, wide open at f/1.2. A mixture of evening light, and the very narrow depth of field from this aperture setting, helped achieve the dreamlike atmosphere. I like everything about it. Is it a proper skateboarding photo? I dunno. I can’t even stand on a skateboard. I’ve tried to avoid looking at other skateboard photos so as not to influence my own vision – no pre-programming. For this shot, I used the excellent Rokinon 14mm f/2.8 (native e-mount). Stopped down to f/5.6, this lens renders just about everything in focus, making it easier to get the shot. While I like the interesting angle and sweeping field of view, I find it to be less intimate than what is achieved with a longer focal length. Perhaps I’m trying too hard to make aerial portraits instead of sports/action shots. No matter – I like this shot a lot. Mark nailed the trick with a perfect landing! These next shots aren’t about catching snappy skateboard acrobatics. Instead, I chose them because – from an outsider’s perspective – they succintly capture the feel of the day. 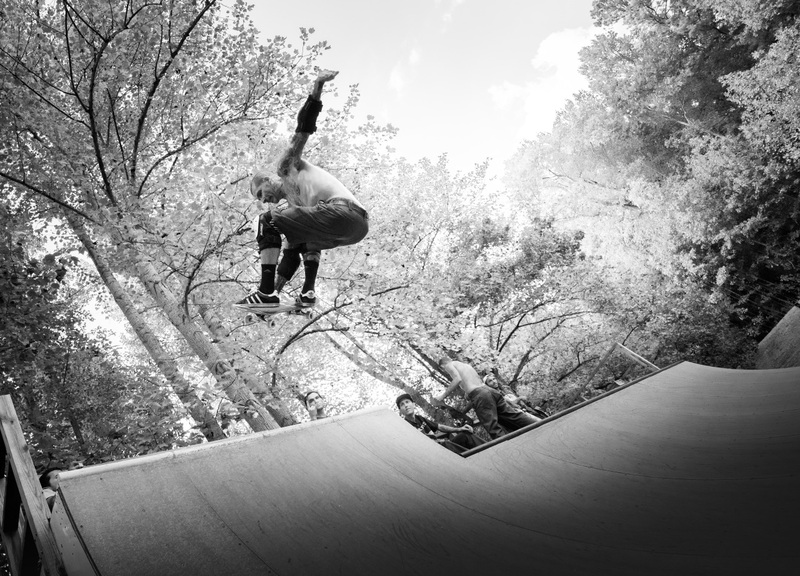 A warm Carolina evening, smatterings of a sunset cut through the trees to decorate the face of the half-pipe while a skater confidently swings like a pendulum from one side to the other. The occasional rail slide breaks up the sound of the cicadas buzzing and chirping off in the distance. A cool breeze gently reminds us that summer is on its way out. That’s what these photo are trying to say… feel it? What excellent shots!! The pictures of Mark are just wonderful! The girls, as always, had such a blast!! So you’re a landscape photographer… and a portrait photographer… and a bunch of other things photographer… it’s nice to see your dabbling in other areas as well!! As always, great eye. I keep up with your post even if they aren’t skating. I can’t wait to talk cameras with you sometime. I’d like that! Next time I’m in town we’ll have to meet up. It was especially cool seeing Mark teach our girls how to skateboard! Can’t believe how quickly they picked up on it. They’re already miles ahead of me! I can’t even stand on a board without a trip to the ER. A lifetime of skateboarding has only produced a handful of good photos and Tom captured several of those in two afternoons….nicely done! Thanks Mark! I’m looking forward to meeting you both, too!